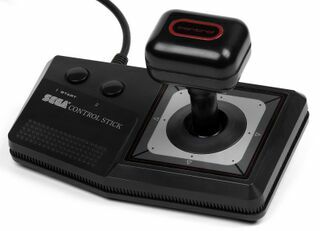 The Control Stick is a Sega Master System joystick designed for right handed control, instead of the typical left handed set-up. It was sold for $20 to 25 in North America, and was also available packaged with the SMS cart OutRun (sold together for $45 to $65) or the Rapid Fire Unit. The Control Stick functions exactly like a standard Master System Control Pad but attempts to give the user a greater sense of control over the on-screen characters. It is not particularly good for games that require precise movements. Interestingly some versions of the Control Stick freely advertise its compatibility with home computers such as the Commodore VIC-20, Commodore 64, Atari 400, Atari 800 and Atari 2600. It is the only Sega peripheral to date to do this, though most Master System (and Mega Drive) controllers will function with these computers with varying degrees of success due to the systems sharing the same type of DE-9 control port.